„Tree of life - in a Circle of Peace for Germany" is the writing on the sign in front of the Tree of Life, that has been bent. „Peace for the world” is a task which can only be achieved together with others. The Tree of Life symbolically overcomes the separation between man and the divine spark in his midst: "Recognize the Holy ..." That is how people are connected in their most inner. Without this realization, no peace is possible. That's why the story starts here. The origin of the idea of the Circle of Peace was rooted in Berlin’s Holocaust Memorial Debate. In 1998 I took part in it with a book. My idea reflected the insight, that in addition to the admonishing memorials of a painful past in the same context we need public spaces and symbols that are dedicated to a good future with each other. This is the "dark side" of the Border Stone. It connects to the German commemorative culture, visible in admonishing memorials about a dark past. There is also a local connection to this darkest chapter of German history. Just below this place in the valley was once a KZ-subcamp. 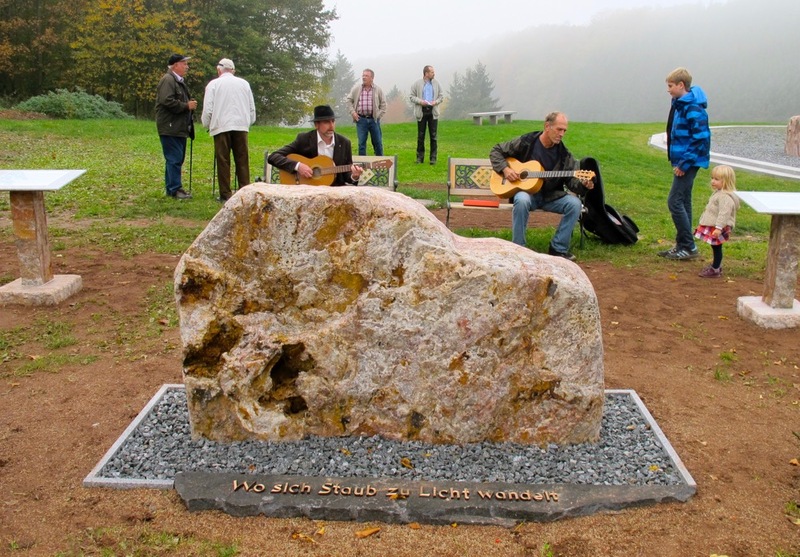 Later Markus von Kempen will briefly present this local history as part of the inauguration ceremony for the Local Council of Hochstädten. Everything that I could investigate later about this history I have published in the chapter "Local past" on this website. 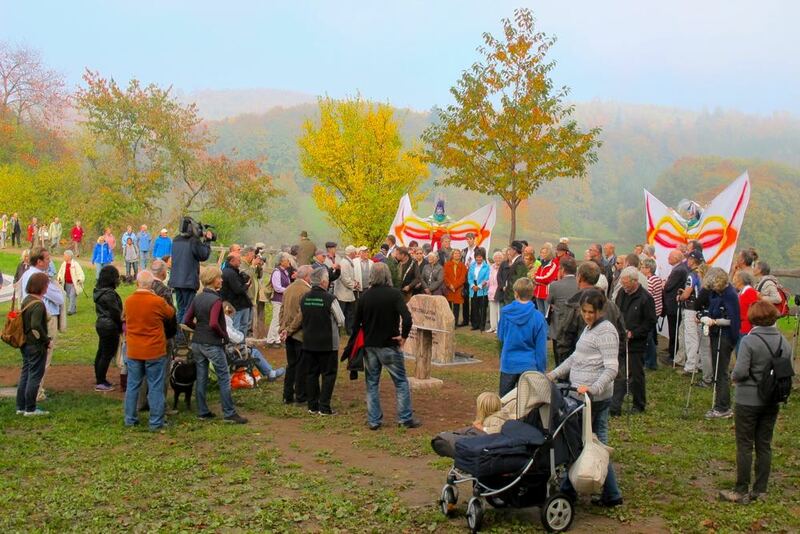 More and more people flock to the Border Stone on a beautiful autumn day. The Border Stone was built alongside a hiking trail, because for peace one has to go a way. What is more, peace is not found then in the noise and loud importance of the world, but rather in a silent pilgrimage experience at a place of beauty and strength, where you can meet like-minded people. This is a preparation of the idea of a "dance floor" - a space of encounters - around the Tree of Life. 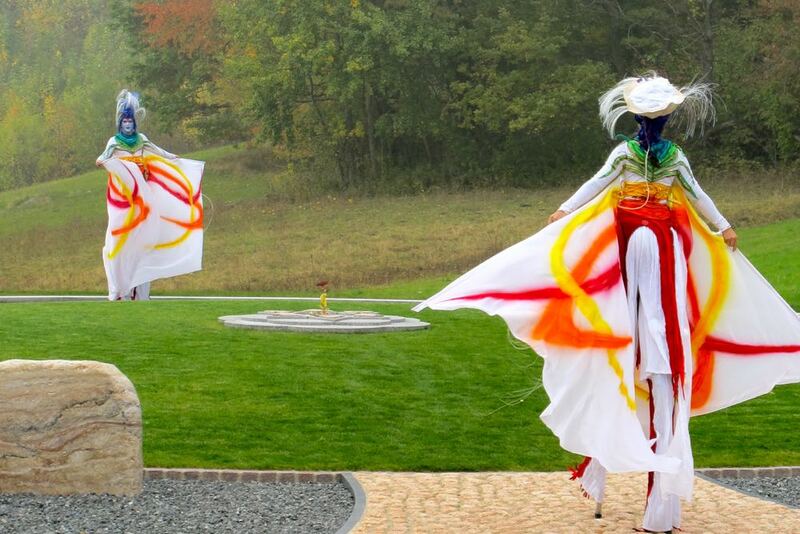 The rainbow dancers give a demonstration. Dance for Freedom around the Tree of Life; its the dance in the colours of the rainbow. This is spiritually understood a sign for the covenant of God with human kind. Through their graceful movements, the dancers provide access to the perception of beauty and joy through a heart that has been touched and moved. "Where dust turns to light" is to read below the Border Stone on a threshold of slate on the ground. The inscription points to the Circle of Peace with the Tree of Life, where a change can be experienced on the walk in the own inner. Peace and freedom begin within oneself. Around the 24-corner one can walk 24 hours a day and then the whole life and yet one would still only revolve around oneself in one’s own egocentricity. But if you stop and go over the Threshold of Humility - the outer threshold of the 24-corner with the inscription „Recognize the Holy in your midst” - this is how you get into this experience: The Tree of Life breaks open a dark ring. The ring represents the alienated mind. 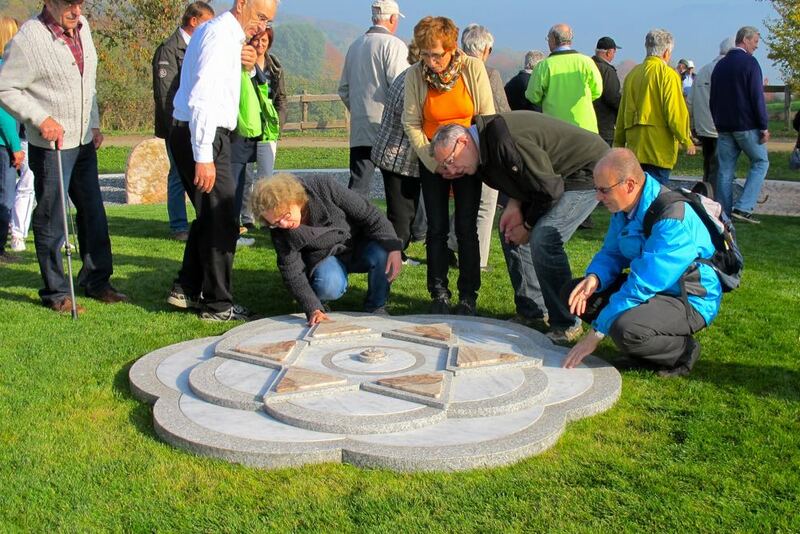 The 11 commemorative stones are „projection surfaces”, because this is how the mind works. Looking at ourselves from a bird's eye view - which is why the Tree of Life is a relief (art form) in the monument – we can recognize ourselves and we are no longer a prisoner of an always limited intellect, but we learn to act from the heart. In our own center, in the relationship between heaven and earth, the ego loses its captivating power and man becomes free within himself. This is the way toward finding inner peace. In that perspective - a view from the standpoint of the Tree of Life - one looks upon the Border Stone, the 12. Stone outside the monument's circle (inner way), remembering a responsibility for life in this world, meaning love and freedom. Greeting of the Frankfurt Rabbi Andrew Steiman for the inauguration celebration: „Jerusalem is wherever beauty is.” The picture shows the other bright side of the Border Stone with the inscription Yerushalayim. It speaks of the beauty of living together, when man no longer needs to be the enemy of mankind, because he can see himself reflected in the other and he could find peace with himself. The free man acts in the world in his peace. The selfishness, being concerned only about the own well-being, loses power. 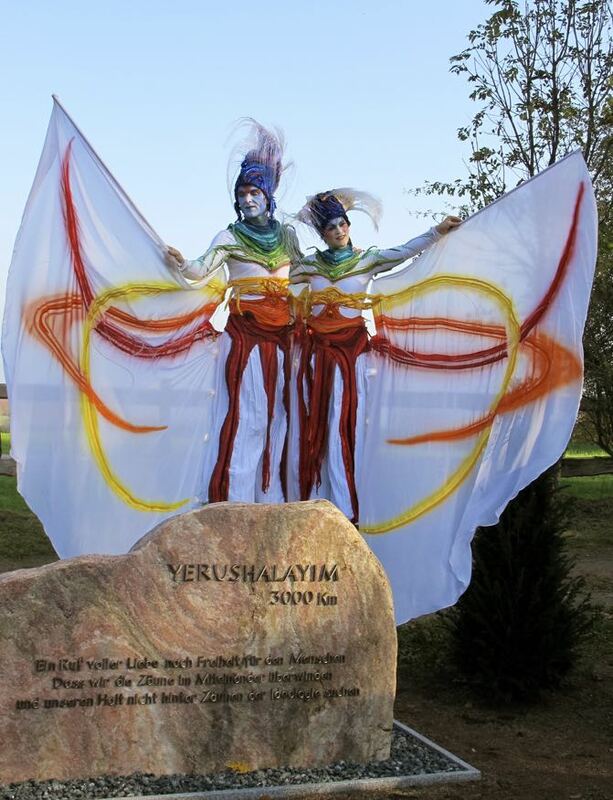 Yerushalayim refers to the hope for peace of the three monotheistic world religions. Does that mean removing all borders and dismantling the fences? 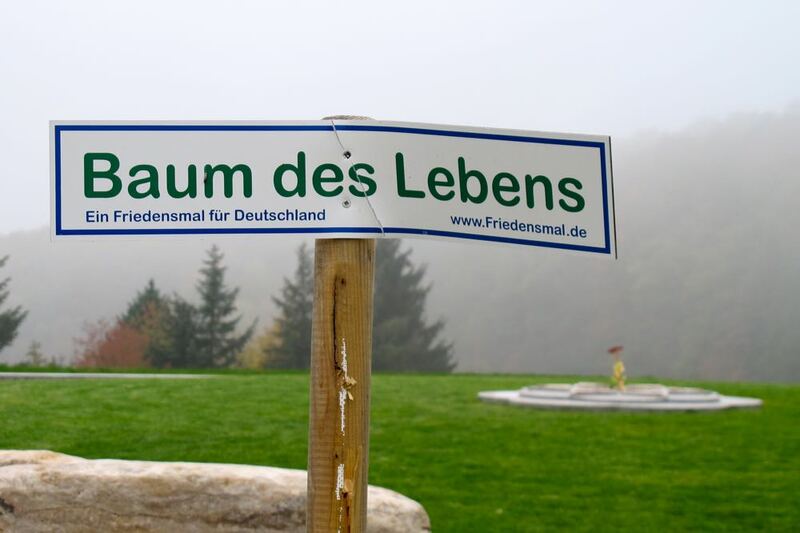 In German the word "Frieden" (peace) is associated with the meaning of "pulling a fence", as the word ""einfrieden" (fence) shows. "Yerushalayim (...) that we succeed in overcoming the (inner) fences in our dealings with one another and do not seek to find our inner stability behind fences of ideology" - reads the inscription on the Border Stone. It is a call of yearning for peace and a respectful interaction of people with each other. Hereby the theme "healthy boundaries" is addressed. The Border Stone shows how on the way inward through the inner peace, boundaries are overcome in the outer. You can set up rigid "fences" around yourself to protect yourself from injury. Anyone who dismantles "fences" must accept injuries. But we have to overcome where possible "fences" between us without wanting to tear them down, so that we can understand each other. So much more freedom and peace would come into the world. However, a world without fences or people who have no boundaries is a dangerous illusion. Because without boundaries your own identity can not be secured. The boundaries should be healthy, meaning, that they are flexible and equitably defined, but not rigid and immobile and no higher than necessary. So you find the healthy balance, to worry about the well-being of others "over the fences", because you also took care for yourself. 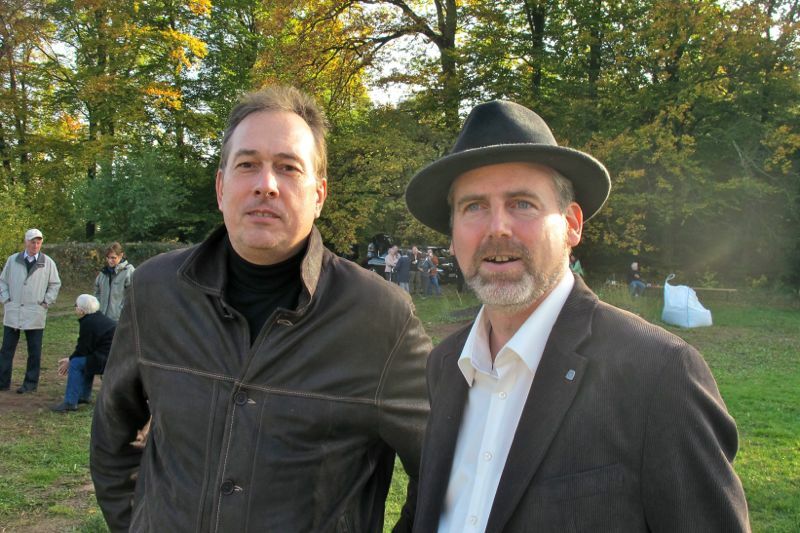 The Bensheim Councillor Oliver Roeder (left) and artist Thomas Zieringer (right) enjoy the festival. From the Border Stone, visitors go to the Rose of Shalom in the middle of the Tree of Life. 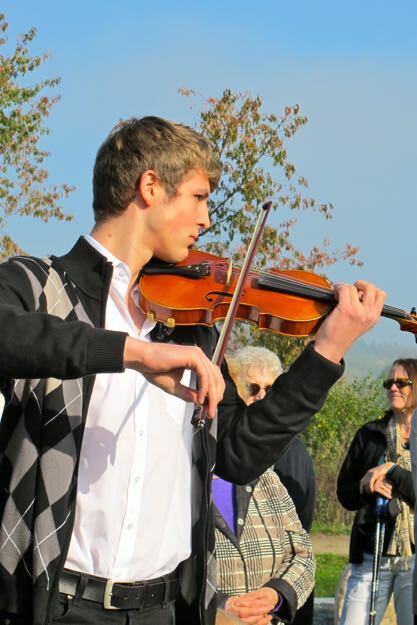 There, the young artist Clemens Limp from Bensheim plays the melody "Jerushalayim Shel Zahav" (Jerusalem made of gold) on his violin. This is the highlight of the inauguration ceremony. The Rose of Shalom in the center of the Tree of Life has people becoming curious. Some people call the symbol on the white rose Star of David and other call it Christmas Star, yet others can see the symbol of the heart for universal love and healing. The symbol lets different people and different religious beliefs get together, because it speaks about a common humanity. The archetypal meaning of the symbol: two triangles are connected with one another in the center of „the heart” (of man); heaven and earth meet each other. The one triangle represents the masculine side, or the spirit (heaven), and the other the feminine side, or the material world in which we live (earth). The world is no longer in balance, because the inner communication of the two poles, which represent the two triangles, has been disturbed. Today this holds particularly true when looking at the relationships between men and women. Yet society, with its hostile manifestation, is also a consequence of this, in that it has led to a situation in which the „male” spirit, the creative power, has removed itself to far away from the feminine sense for the world. Ideological aloofness is even disruptive for a society and its neighbors. However, it's not about a one-sided problem „of men”. It was also just another sign of a disturbed internal communication, when the male is no longer allowed to be and it is not accepted as a healthy and necessary part of the whole, just as the female is. - The Rose of Shalom is a symbol of the heart. 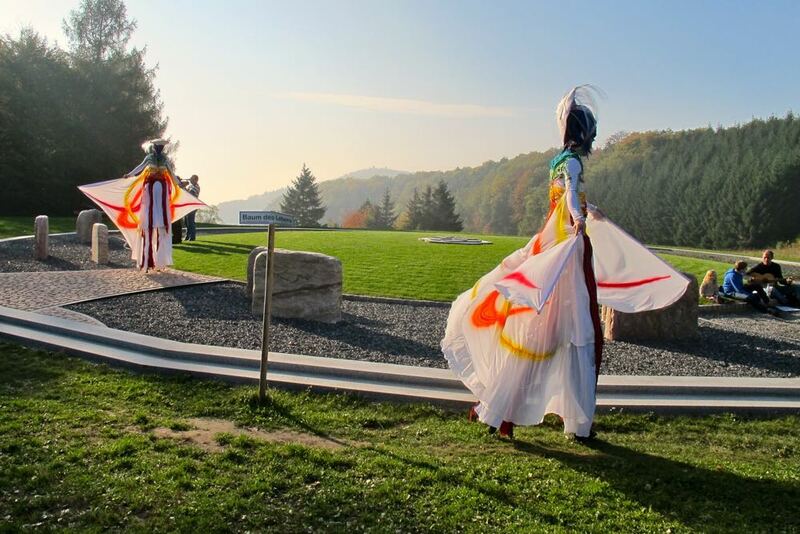 The photographer was standing next to the Circle of Peace and he was taking the picture with the view down into the Rhine Plain (ShUM cities). Striking is the formation, which the cows form. It is unlikely that this red cow meets the criteria of the Tora, but I also want to treat this phenomenon as a parable. 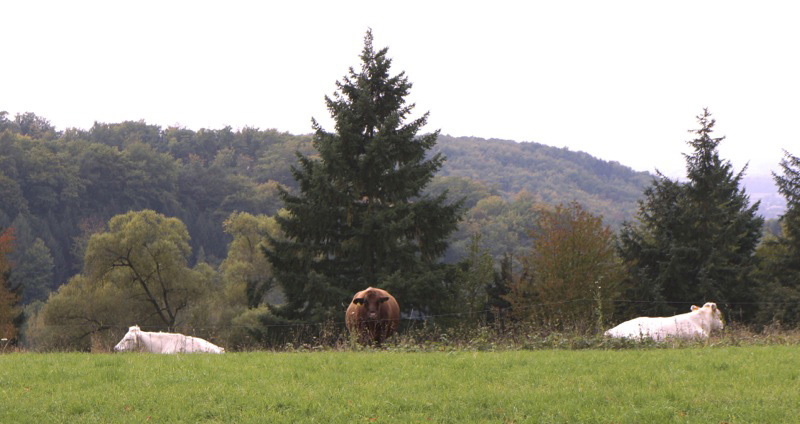 The cows are located exactly at the border to the Site for Peace and Freedom. This photo was taken by chance directly after finishing the construction of the Border Stone with its inscription „Yerushalayim”. It had been 10 days before its official inauguration. Only with the Border Stone, which also designates Judaism through Christianity as an essential root of our culture, later the Garden of Freedom could emerge. 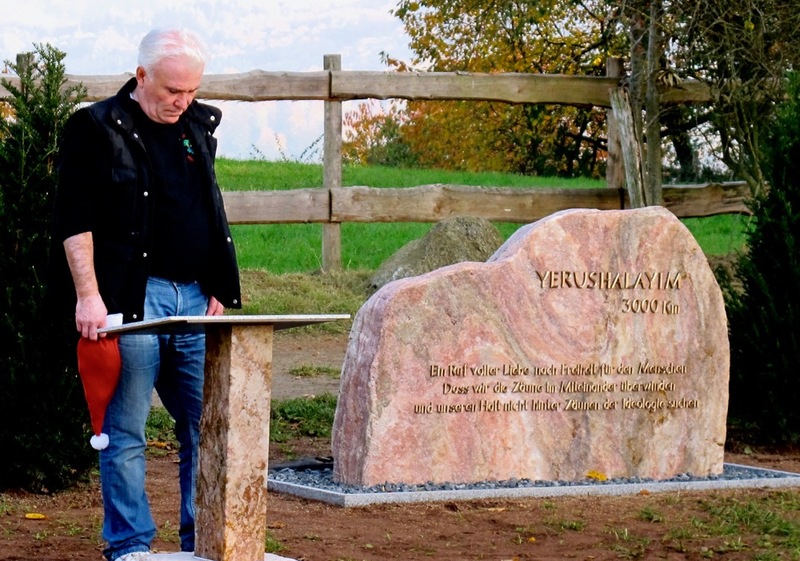 The Border Stone refers to the cultural root "Jerusalem", recalling the values of freedom (the Torah) in the consciousness that Judaism - even in Germany - is more than a reminder of the Holocaust. It is a religion that focuses on life. What is the connection to the text about the "red cow" in the Torah? The text is about a cleansing from death.